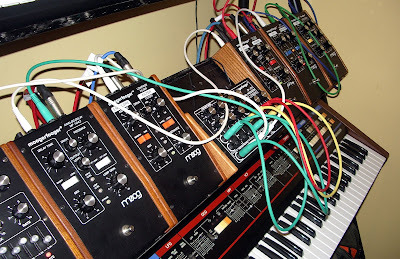 Next up in our CV fun day set of samples was our extensive range of Moogerfoogers. Regular readers will know we love these little beauties so really needed no more encouragement for a play. Because of all the extensive CV in/out options it's quite possible to chain the 'foogers together to create a very basic modular synth. The sound source was provided by a waveform from the CP-251 or Osc output from the FreqBox. This was then filtered, modulated, delayed, sent through the ring mod and Murf - all synced (or not) with CV signals via the CP-251 control processor. Flame on! Bonus samples for ya.